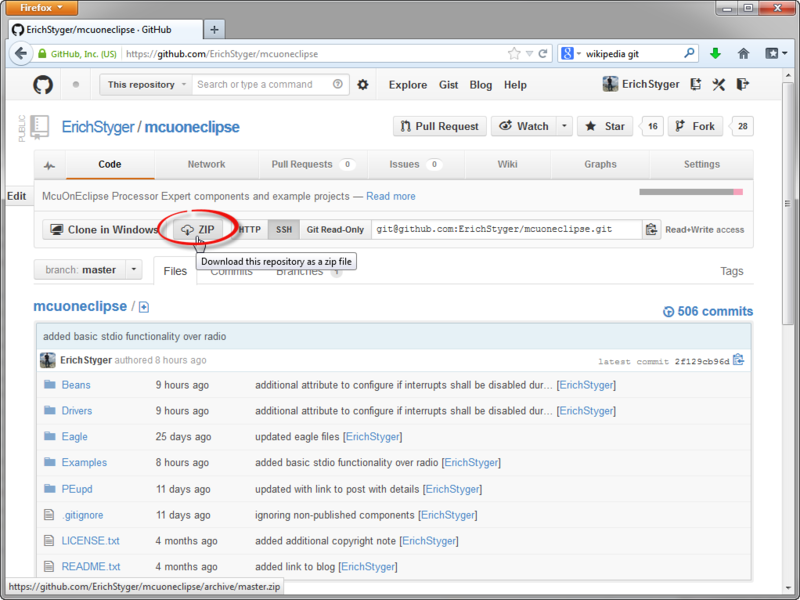 💡 How to use Git with the MCUonEclipse GitHub repository, see this wiki page. 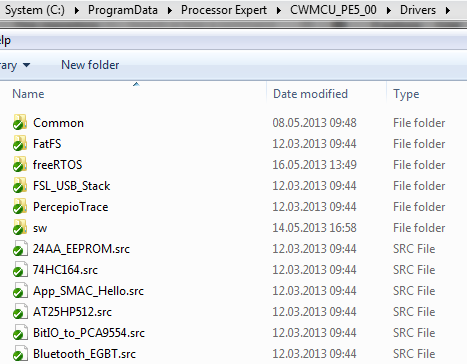 First, you need to find where Processor Expert stores the ‘user’ components. This might depend on which Processor Expert version you are using. 💡 I recommend to create a shortcut on the Windows desktop to that directory location. 💡 ‘user’ components are components ‘outside’ of the Processor Expert installation. 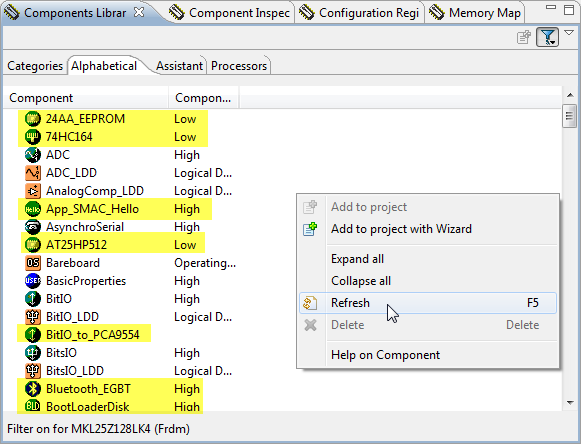 Components I have created with CDE (Component Development Environment) or components you have imported. 💡 the CWMCU_PE5_00 has a green check-mark, because on my machine I have it under (GitHub) version control. PECache: this is a folder which is used by Processor Expert for caching the components. 💡 In case of troubles with Processor Expert, sometimes it helps to delete the PECache folder. That cache folder will be re-created a Processor Expert startup time. 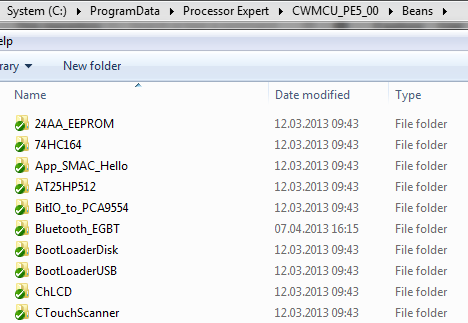 In my steps below I will use the CWMCU_PE5_00 folder, but things apply to the other PEx_yy folders too. Note: To my knowledge, the Processor Expert drivers are compatible between the different versions. So if you want to use the same components across different folders as above and in sync, you need to synchronize them manually (or copy them between the folders). This gives you an archive file with all the latest and greatest files in the repository. ❗ Close CodeWarrior/Eclipse/Processor Expert/Driver Suite first. 💡 In case you already have beans/drivers or other files in this folder, then it is a good idea to make a backup of this folder, or rename it so you can go back later on. If you already have older versions of the components, then I recommend to remove/rename/delete the folder too to have a clean state. Unzip the two folders into your Processor Expert user working directory (mine is C:\ProgramData\Processor Expert\CWMCU_PE5_00). 💡 it does not hurt if you unpack the repository into the user working directory. 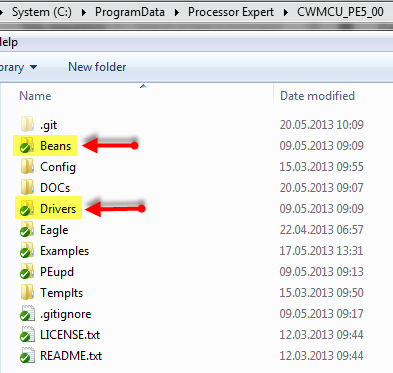 But if you only interested in the components, then only install the Beans and Drivers folders. DOCs: HTML files created by the Bean Wizard? 💡 the “Bean Wizard” is the ‘classic’ version of CDE to create user components. So you do not need to worry about these folders. All what you need is ‘Beans’ and ‘Drivers’. 💡 See this post about a dissection of the different Processor Expert Driver files. With this, you are ready to use the components :-). I recommend to extract the projects you are interested in either into your workspace, or that you unzip it to a place outside of your workspace and then drag&drop the project(s) into your workspace. If the components are properly loaded, they should show up in color (otherwise they are grayed out if missing). It is not hard to use Processor Expert components or projects from GitHub: the repository can be downloaded as zip archive. As for the components, I need to place the Beans and Drivers folder into the right place. The projects I can use like normal Eclipse/CodeWarrior projects. 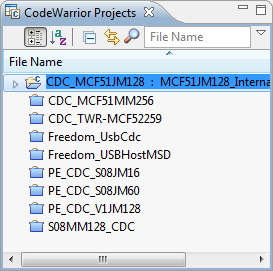 This entry was posted in CDE, CodeWarrior, Embedded Components, FatFs, FreeRTOS, I2C, Processor Expert, Tips & Tricks, USB and tagged CDE, codewarrior project, collaboration platform, Embedded Component, open source projects, Processor Expert, software, software project, technology, Tips&Tricks by Erich Styger. Bookmark the permalink. GIT is a distributed version control system, so you can have the full history locally on your machine, even if not connected to the remote repository. This means: you have a copy of the repository on your local machine, or where you copy it. This helped me get the files I needed thanks. I am looking at a 24FC interrupt based EEPROM driver. Between the 24AA_EEPROM and the genericI2C is this possible? yes, I think this is possible. Are you going to contribute this? ok, I think I start to realize that you posted a similar request in the Freescale forums (where I responded too). Good news for you: the 24AA_Component supports now the 256/512/1024 variants. But I have not looked into enabling interrupts on the I2C side. It might be that it works out of the box, but I’m not sure (it has been a while since I used the 24AA). 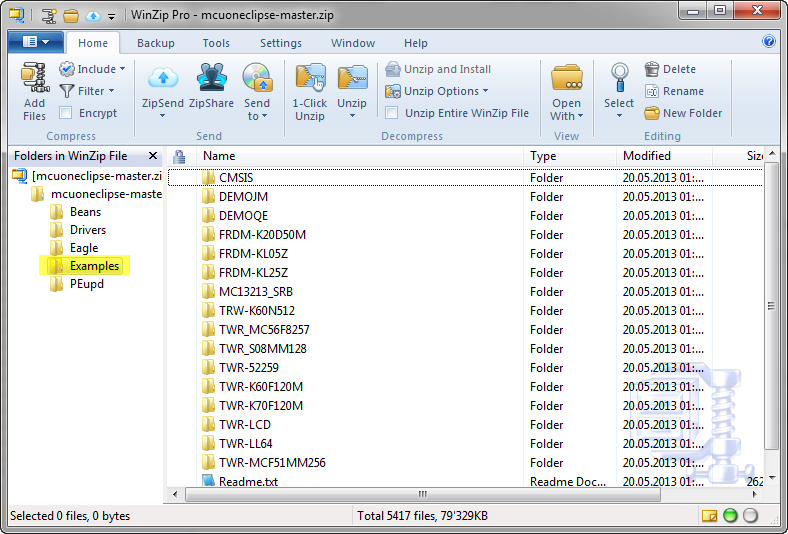 I was able to download the mcuoneclipse-master.zip and verify (with 7-zip) that the archive was downloaded error-free. I was able to import all those components without error. BeanLoader.loadTemplate: error loading template Templts/Init_PWM_MCF.dev error: Could not find template file. Above, you said you didn’t use the “Templts” on your system, but it seems that maybe this component does. :). Do you know how to fix? I’m using DS-5 with PEx and I’m targeting the Vybrid Tower. I would need to check that. I’m not using ‘external’ template files, but the components themselves are using templates (together with interface files). The thing is this: I’m using that PWMServo16bit component ColdFire (ColdFire has normal 8bit PWM registers, but special 16bit registers). That’s why the component seems to refer to that MCF (MCF stands for Motorola ColdFire). Obviously you do not have ColdFire Processor Expert installed. I would need to check what the solution would be, but I do not have DS-5 and Vybrid (yet). Could you just use a normal PWM instead? Can you try the Servo component instead (I have not tested it with ARM/Vybrid)? I tried to use the Servo component, but it gives me errors. It says that “Component is not selected”, so I figured it was referring to the TimerUnit_LDD component it automatically added. Under System->Shell->PWM, it says “Error in the inherited component settings”. So I picked “FTM0_CNT for the “Counter” field, but the “Module name” field stayed blank. Under “Details”, it said “Unassigned peripheral”. I looked at your link. I think I found a problem. Looking at the pic “Servo1 PWM Configuration”, you are able to configure the PWM component. 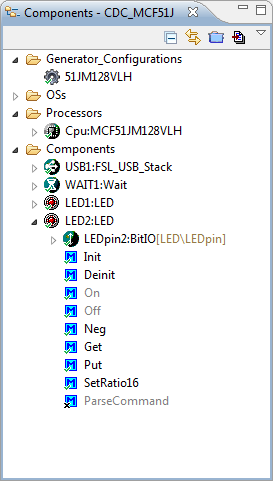 I am not able to – the entire Component Inspector for the included PWM is completely grayed out so I cannot configure anything. Any idea why that might be? Okay, I just recovered from that. PEx was asking me about including TimerUnit_LDD, but that dialog was underneath the other big window. I dismissed it and now I’m able to configure the PWM component. However, I still have errors. When I try to select a PWM or PPG device, the drop down box has every item precded by a “[!]”. What does that mean? The output pin dropdown box has the same thing. Does that mean those pins are not available? Yes, that [!] means that a pin is already used by something else and not availble. You can hover over it and it should tell you with a tool tip what is using the pin. Do you know how to fix that? Thanks so much. Can you point me to the downloads/tools you are using so I can try it out on my machine? My Processor Expert does not have an option for Vybrid. I’m running this on Ubuntu 12.10 32-bit. I also took screen shots of the problem. if you’d like those, I can send them to you (five .png files). Thanks. P.S. I just noticed that PEx v10.3 came out just yesterday. See 2nd link above. Ok, I need to download that. Thanks for the links! I was able to use the TimerUnit_LDD component and simply set the period time and offset to do what I wanted for a PWM. However, I’m still interested in seeing a PWM component work for Vybrid (esp the M4 core).